The Power of Being BrandNiquely™ You! with Elyshia Brooks, MBA. Your Personal Brand MATTERS! The way you present yourself says a lot about you and how you value you and how others will perceive you. Are you ready for that next promotion, or that next big opportunity, perhaps are you really ready to have a seat at the table ladies and play with the best of them? Learn how to be better equipped to present yourself in such a way that others will have to level up to work with you? Living your best self and creating a brand that shares with the world exactly who you are means investing in YOU! It’s time to get ready to walk boldly into your next, but it is up to you as to how you show up and present yourself. I get to be on a panel with some amazing women, Evelyne Billingslea and Nicole Crawley! We will be discussing the book “Crushing It! by Gary Vaynerchuk and having real candid conversations about how do business and show up! Social Media is taking over and you need to know how to navigate to show the world your greatness. Let’s talk about if and really step up, live your best life and Be BOLD in our businesses. The Purpose for BrandHER™ Program is for those ladies who have a brand or idea, but need to define it, develop the program or service, solidify pricing and polish up her BrandNique™ Image to attract her Divine Clients along with tools to level up her BrandNique™ Lifestyle. ~ Stuck trying to figure it out all by yourself and it has not gotten you anywhere. ~ Don't know where to begin in defining, developing and designing your brand identity. ~ Your business is stagnant and needs some redefining, work through a specific challenge and or desire to build a strong and viable brand that serves others and how to level up in the world as your best self. ~ 1x/week High-Level Content Information including live 75 minute, action packed assignments to build up your self-confidence, develop your personal brand and business building strategies. ~ 1x/month “Ask Elyshia Anything” for 60 minutes (Friday) on personal branding, walking in your power and life questions to build the whole person. ~ A BrandNique™ Business Blueprint for building reputation and brand awareness, along with attracting your divine clients to pay you your worth. Your Blueprint will get you on track and focused to your Signature Products & Services. The Women's Empowerment Mixer is for the Ladies who desire to Level-Up to live your best life. Charlotte, North Carolina on September 22nd from 2:00pm -5:00pm at the Carole Hoefener Center Geechee Gal Vintage of Atlanta, Georgia will host the Women's Empowerment Mixer. This is the. last stop of this year's tour and we're excited to announce SOLD OUT events in Atlanta, Savannah and Jacksonville Florida. Tickets are ONLY $10 and includes 5 speakers and Elyshia Brooks as our Keynote Speaker. We will have shopping with various vendors, prizes, lite bites and more! Click the link below for more information. Speakers Include: Nicole Burton of Charlotte, NC; Elyshia Brooks of Charlotte, NC; Tammy Stone of Savannah GA; and Love Fab Jewels of Savannah GA. Your Personal and Business Brand Communicates your VALUE to the World -- not only to Potential Business Clients, Partnerships and Employers, but to Everyone. It is Essential Today for you to INVEST in Yourself, Your Brand and Business, because it is Your Reputation. Personal Brand Intelligence™ speaks to Personal Mastery, Unique Identity (personal and business) Development, Relationship Management for Career Advancement and or Establishing Yourself as a Leader. Expressing Who You Are, What You Do and Why You Do It Will Help You Position Yourself for Success and Open Doors of Opportunity. It’s Time To Upscale Your Investment...If You Are Going To Walk In Your Greatness and Not Just Talk About It! The course includes the framework of various techniques that will build a fierce brand ready to take to market for your audience. Additiomally, in this session you will discover the strategies that the pros utilize to get their brand acknowledged on social media: Determine which platforms to use, create your biography, what content to post, and how to engage with others online. Your digital media strategy can be a game changer!!! This course will include the framework of various techniques that will build a fierce brand ready to take to market for your audience. Additionally,in this session you will discover the strategies that the pros utilize to get their brand acknowledged on social media; determine which platforms to use, create your biography, what content to post, and how to engage with others online. Your digital media strategy can be a game changer!!! Providing Branding and Marketing Strategies to equip, enhance and engage your business brand to reach your ideal clients. How you show up and present yourself means a lot to your business. If you know that 2018 if your Breakout Year and you are no longer going to do things as you have been doing. You know that if you don't change NOW, it will be the same as this year and the last years , which have gotten you no where! It is your year of Elevation! in ALL areas of life, personally, professionally and in your business. It is time for a serious change and you are ready to INVEST in IT and YOU!! I want to offer my last 1-Day Intensive to you those who are serious to make a change for 2018! It is not for everyone, because everyone is not ready! You Are Ready! 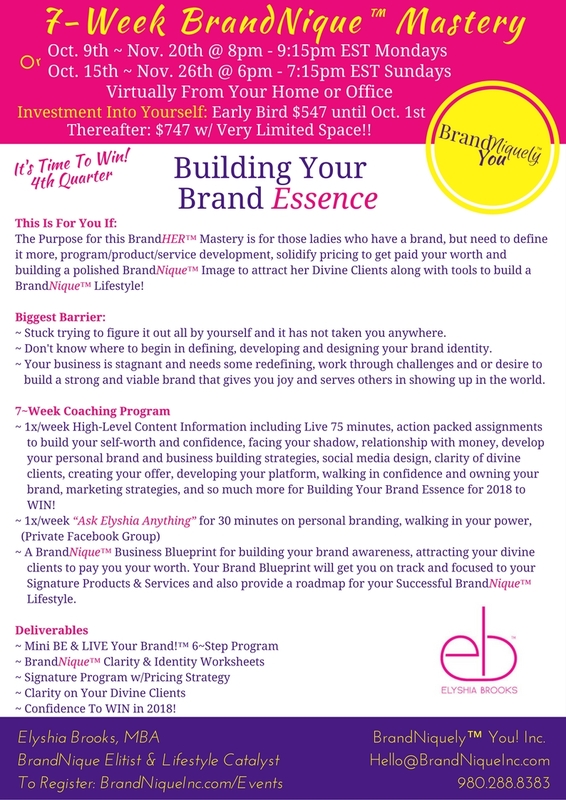 The Purpose for this BrandNique™ Brand & Business Breakthrough™ 1-Day Intensive is for those ladies who have a brand, but need to define it more, program/product/service development, solidify pricing to get paid your worth and building a polished BrandNique™ Image to attract her Divine Clients along with tools to build a BrandNique™ Lifestyle to soar in 2018! * Tired of playing and living small...you are ready to live life out loud! * Stuck trying to figure it out all by yourself and it has not taken you anywhere. * Don't know where to begin in defining, developing and designing your brand identity. * Challenged with CHARGING Your Worth! * Being a Bold, Brave and BrandNique™ Brand in 2018! Now Is The Time To Really Do This...No More Excuses! The Purpose for this BrandHER™ Intensive is for those ladies who have a brand, but need to define it more, program development, solidify pricing and polish her BrandNique™ Image to attract her Divine Clients along with tools to build a BrandNique™ Lifestyle. Stuck trying to figure it out all by yourself and it has not taken you anywhere. Don't know where to begin in defining, developing and designing your brand identity. Your business is stagnant and needs some redefining, work through challenges and desire to build a strong and viable brand serve and show up in the world. 1x/week High-Level Content Information including live 75 minute, action packed assignments to build your self-worth, develop your personal brand and business building strategies. 1x/month “Ask Elyshia Anything” for 30 minutes on personal branding, walking in your power, or your business success. A BrandNique™ Business Blueprint for building your brand awareness, attracting your divine clients to pay you your worth. Your Blueprint will get you on track and focused to your Signature Products & Services.Deliverables Mini BE & LIVE Your Brand!™ 6~Step Program BrandNique™ Clarity & Identity Pricing Strategy Clarity on Your Divine Clients, and Signature Program. A 4-Week Intensive to really jumpstart your BrandNique Identity for 2017 and to put some systems in place in order to ensure that you have a surefire business and brand in 2017. Creating you BrandNique Identity and Business, so that you can position it for growth, scalability and abundance. Aren't you READY?!?! Limited Seats and ONLY for the SERIOUS-MINDED!!! Speaking at Charlotte Dynamic Women 11:30 am; Group Contact Bliss Green Speaking on "Your Personal BrandNique™ Identity Goes Before You!"